Digital distributor Direct2Drive has rolled out a new rental service allowing customers to pay five bucks for five hours of playtime. PC game rentals have historically been a thorny issue. There was a time when it was actually quite common, but the rise of consoles and, even more important, worries about the ease of piracy finally brought the practice to a halt. But Direct2Drive seems poised to bring it back, after a fashion, with a new digital rental program that gives players five hours for five bucks. The concept is fairly simple. You pay $5.00, download your game of choice and play it for five hours - all at once, spread out over a weekend, whatever you want. If you decide to buy the game after the "rental" period is over, the $5.00 will be deducted from the purchase price; if five hours is enough to scratch the itch, then it's game over and everybody goes their separate ways. Only four games, F.E.A.R., Divinity 2: Ego Draconis, Silent Hill Homecoming and Grid, are currently available to rent, but presumably there will be more coming soon. It's a simple idea but one with some obvious appeal. 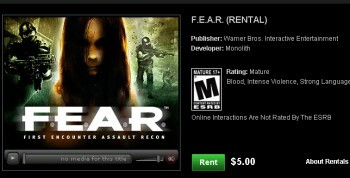 A five-dollar, five-hour rental may not be of much interest for games like F.E.A.R., which can be bought outright for $10, but for more expensive games it could be a very attractive option. The current selection probably won't draw in a lot of customers but if Direct2Drive can substantially broaden the titles on offer, I could see it being a big success, possibly even enough to convince other digital distributors to try something similar.